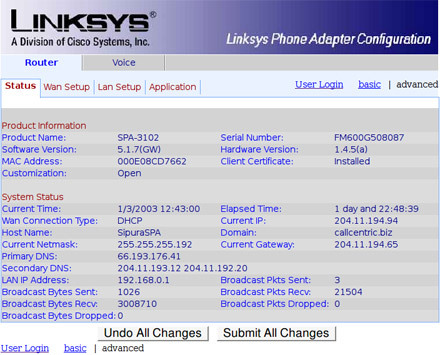 The SPA3102 is a Linksys device, similar to the PAP2/T line of devices in appearance and configuration. In addition to the similar appearance the SPA3102 also adds extra features not present in the PAP2/T such as an FXO (Foreign Exchange Office: allowing you to use a normal PSTN line or PBX line for redundancy in case of an outage on your ISP...etc) and a built in router allowing you to share your internet without the need for a standard router/switch. The SPA3102 is reliable and relatively inexpensive and can be considered by individuals who want the extra PSTN functionality for their specific environments. 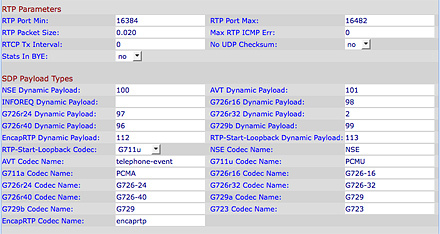 The configuration information below is based on firmware version 5.1.7(GW), which is the latest version as of this writing. Before we proceed please make sure that your SPA3102 is powered on and that you have an ethernet (RJ45) cable connected with one end to your router/modem/gateway and the other end to the blue port on the back of the SPA3102. You will also want to connect a regular telephone (RJ11) cable to the phone port labeled "Phone". Once you have verified this please continue configuring your device with the instructions below. 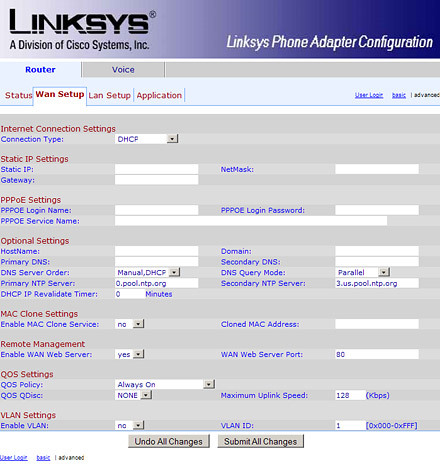 You will hear a message - "Linksys configuration menu. Please enter option followed by the pound key...", then enter 1 1 0 # on your phone. You will hear the menu prompt again after acquiring the IP address. After hearing the prompt dial 7932# followed by 1# then 1 when asked to save the change. You should now have the IP address for your SPA3102 as well as the ability to configure your device through your web browser. Continue onto Step 2 below. 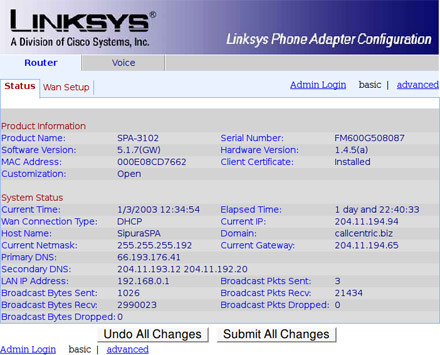 Else if your PC is connected to the yellow port on the back or your SPA3102 then the SPA3102 IP should be 192.168.0.1, unless you changed the subnet in your advanced configuration. Once you have acquired your device's IP continue on to Step 2 below. Now that you have your device's IP address simply open your favorite web browser and enter the IP address in the address bar and press enter. Please note: You do not need to enter the leading zero's ( 0 's ) in the IP address. For example if you heard "192.168.001.010" you should change this to "192.168.1.10"
We are now ready to enter your Callcentric account information as well as properly configure your time and DNS servers. Continue to Step 4. "time.nist.gov" and "time-a.nist.gov" are two primary time servers provided by the US Government for public use. 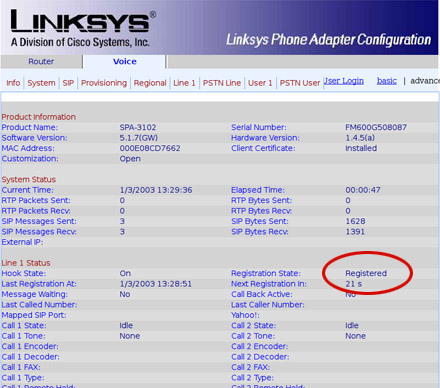 The time server primarily will be used to show the correct time on your phone's caller-id display when you receive a call. Once done scroll to the bottom of the page and click on Submit All Changes to save your changes. Once the page reloads click on the Voice tab at the top of the page and go to Step 5. Click on the tab labeled SIP from the menu at the top. You will be provided with the various low level SIP protocol and codec related options we will need to change in order to make sure your device is configured properly. Click the Submit all changes button after you have finished entering all information on the SIP page. User ID: This is either the default extension 1777MYCCID OR 1777MYCCIDEXT, where 1777MYCCID is the 1777 number assigned to you by Callcentric and EXT is the three digit extension you are trying to register this UA to. Auth ID: This is either the default extension 1777MYCCID OR 1777MYCCIDEXT, where 1777MYCCID is the 1777 number assigned to you by Callcentric and EXT is the three digit extension you are trying to register this UA to. Click the Save Settings button after you have finished entering all information on the Line 1 page. That's it! You can now make a phone call.